Fundamentally, Lisk (LSK), has positively made news, as a result, we’ve seen massive rallies in the March month’s series of trading (almost up about +18.70% so far). But for now, little edgy from the last couple of days. 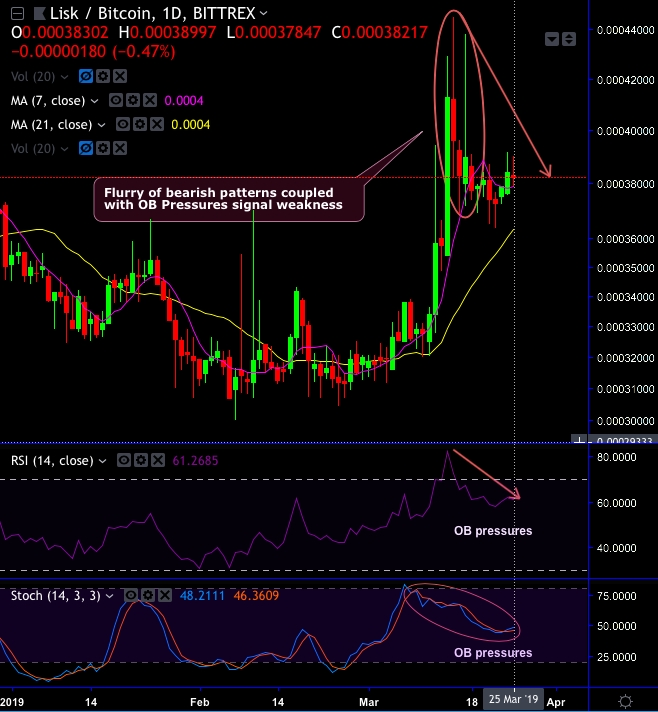 Technically, LSK/BTC has formed flurry of bearish patterns that is coupled with overbought pressures to signal weakness. Lisk token has launched for trading on one of Europe’s leading retail crypto exchanges, Bitpanda. Consequently, Lisk won a community vote for the right to list on Bitpanda, indicating strong support for the token from retail traders in Europe. It is now evident in its underlying price rallies. However, it is unwise to isolate and give total credits to the news as the pair had actually bottomed out the bear trend in February month only but stimulated from the beginning of March owing to the news. As you can observe the daily plotting of this LSKBTC, shooting star and hanging man patterns have occurred consecutively at 0.00039598 and 0.00038293 levels. The stiff resistance is observed at 0.00038783 levels, where the major trend appears to be weaker as upswings restrained below 21-EMAs. Both momentum oscillators (RSI & stochastic curves) show downward convergence to signal overbought pressures. Hence, on daily trading grounds, it is wise to short LSKBTC on rallies for further downside targets up to 0.00036360 levels as one could foresee more slumps upon overbought pressures. Currency Strength Index: FxWirePro's hourly BTC spot index is inching towards -87 levels (which is bearish), while hourly USD spot index was at -41 (bearish), while articulating (at 14:01 GMT).